A small fast prime goes wonderfully with a micro 4/3 camera. 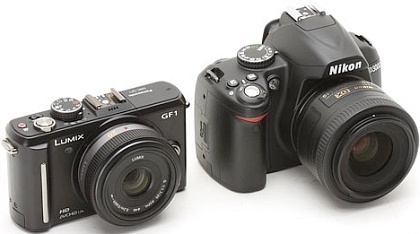 The small Nikon D3000 with its small 35mm f/1.8 looks huge by comparison. My favourite camera review site, DPReview, just posted a short article on desirable lenses for small (read: Micro 4/3 and Samsung NX) cameras. This nicely complements my recent post on the rise and fall of the digital SLR. As a user of a mid size DSLR I completely agree with the article – when at a social event I’d prefer to swap my Nikon D80 with its 35mm f/1.8 lens for a Panasonic GF1 with 20mm f/1.7.